The 'wot-tac' is an all new quick reference race planner to help all sailors predict start line bias, course bias and downwind gybe angles. For the racing sailor the wot-tac will predict effectively the start line bias for a committee boat start. And, if the wind has shifted, it will predict whether a gybe or bear away set should be used after the windward mark. 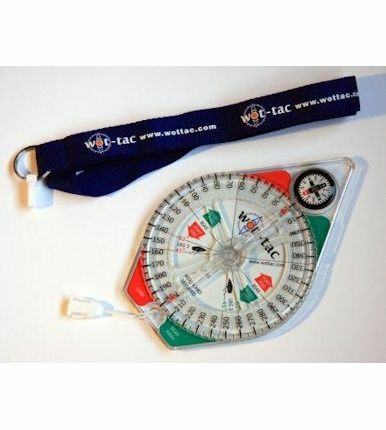 The wot-tac uses an anticlockwise dial to predict the wind angles and, without any batteries or microchips, is a simple and effective sailing device that helps all sailors. This simple tool can take the maths and the guess work out of the start line instantly. Helping you quickly make your start decisions so you can start thinking about your positioning rather than the bias! The wot-tac is hand held and sized so that it can be conveniently kept in your buoancy aid pocket or on the supplied lanyard. It is made of robust plastic and suitable for sailors in all types of classes.